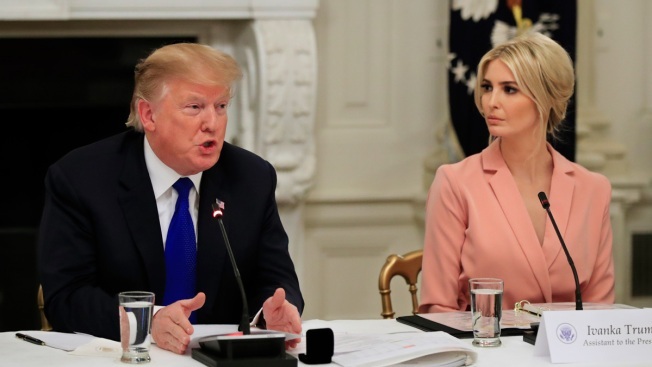 President Donald Trump with American Workforce Policy Advisory Board co-chair Ivanka Trump, speaks to the advisory board's first meeting in the State Dining Room of the White House in Washington, Wednesday, March 6, 2019. On Monday, the Trump administration released several proposed changes to the Higher Education Act, which is in the early stages of reauthorization by Congress. The proposal recommends reducing the number of federal loan repayment options and capping the amount of student loans that parents and graduate students can take on. Currently, Americans owe roughly $1.5 trillion in student loans, a 350 percent increase since 2003. Today, there are many different repayment plans that federal student loan borrowers can choose from, including the Standard Repayment Plan, the Graduated Repayment Plan, the Extended Repayment Plan, the Revised Pay As You Earn Repayment Plan (REPAYE), the Pay As You Earn Repayment Plan (PAYE), the Income-Based Repayment Plan (IBR), the Income-Contingent Repayment Plan (ICR), and the Income-Sensitive Repayment Plan. The Trump administration’s proposal suggests consolidating repayment options so that the government would offer just two plans: one standard 10-year fixed plan and one income-driven repayment plan. The latter would limit monthly payments to 12.5 percent of a borrower’s discretionary income and offer loan forgiveness after 15 years. “Consolidating the programs and having more people be on an income-based plan is really not very controversial — it doesn’t mean it’s easy to pass, but it’s not controversial. It’s the specifics that are more controversial,” Sandy Baum, nonresident fellow at the Urban Institute and professor emerita of economics at Skidmore College, tells CNBC Make It. Baum says the percentage of discretionary income owed and the years until forgiveness are subject to change. Some say the proposal would reduce borrowers’ options, while others say it would simplify the repayment process. The administration proposes capping the amount of federal student loans that parents and graduate students can borrow, citing a 2017 report from the Federal Reserve Bank of New York that argues expansion of federal student aid leads to an increase in college tuition prices. Progressives have contested this theory in the past, arguing that tuition prices rise even when federal aid does not, and that tuition increases are more closely correlated to cuts to state education funding. The proposal did not specify at what level federal loans would be capped. Currently, dependent undergraduate students are able to borrow up to $31,000, and independent undergraduate students can borrow up to $57,500, through the PLUS Loans program. There is currently no limit to the amount of federal student loans graduate students and parents can take on. Some fear that limiting access to credit in these ways will disproportionately impact middle- and lower-class Americans, who rely on federally-subsidized loans to earn their advanced degrees. Others say the proposal does little to address the true causes of the higher education affordability crisis. James Kvaal, president of The Institute for College Access & Success, also took issue with the proposed loan cap, and rejected the claim that the availability of loans is driving rising college costs. “The solution is to invest more in Pell scholarships for low-income students, [and] to work with states to make public colleges and universities more affordable,” Kvaal tells the Associated Press.